I started to run a bit in the fall of 2013. But soreness cropped up in both knees and a lot of muscles in general. So I backed off, and did simple exercises to improve leg strength. I also realized that trying to start running the same way I did in my early 20s was not going to work because I was now approaching 60. I found a training guide for older, beginner marathoners, which involved a lot of walking for the first three months. I started walking in July 2014 and from there I was on my way. I kept expectations low. I wanted this to be enjoyable. I told no one that I was running again to block out external distractions and any pressure. If I couldn’t do it, then I could quietly walk away from it. 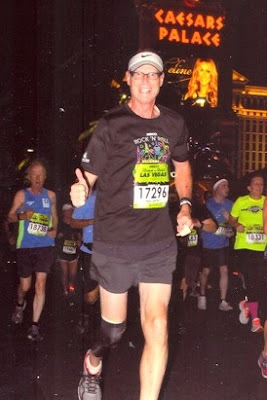 As I approached 60 (I’m now 63) I decided to see if I could do one more marathon, which I did in 2015 in Chicago. Then I did Chicago again in 2017 and the New York City Marathon in 2018. I've also run 10 half marathons since 2015, but instead of just doing ones around Illinois, I opted to travel, to see the country, on foot, so to speak, and have done halves in Chicago, St. Louis, Las Vegas, Phoenix and New Orleans (some more than once). What changes have you seen in races since your hiatus? I called my getting back to running experience my Back To The Future moment, since I stopped in 1985 and resumed in 2015 (mirroring one of the time jumps in the films). Because I had cut myself off so much from running, my mindset was still in 1985 when it came to getting my first pair of running shoes, and a couple of shirts and shorts. Boy, that was an education! It took me a while to adapt to everything new about running. When I did a half marathon in downtown Chicago in July 2015 it was my first race - to the week - in 30 years. Gone were the mass starts. Instead I was placed in something called a start corral. And my bib had a computer chip in it to track me (incredible!). And as far as entry fees, it wasn’t the 1985 prices of $5, $6 or $7 to get into a 10K for sure. And the size of the races! When I ran the Chicago marathon in 1985 there were 3,600 finishers. In 2015 there were 37,400 finishers (whoa!). 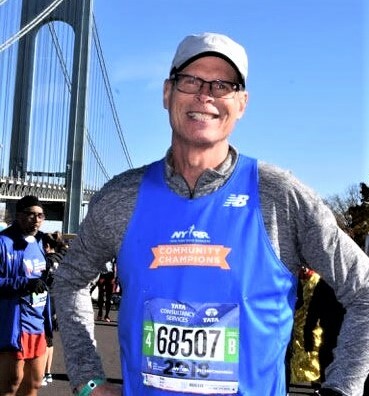 And at the 2018 New York City Marathon I was part of a world record field of 52,800 finishers (holy cow!!). What else has changed, such as your training for racing? 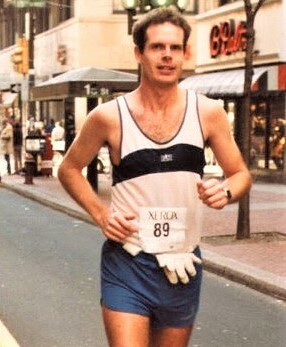 I try to be a smarter runner that I was back in the 80s. I now run only four days per week, allowing my body more days to recover. During peak marathon training, I will hit a maximum of just 37 miles per week. Overall I run about 850 miles per year right now, way down from just over 2,000 when I was younger. I also do slow, stretching exercises to loosen up those older, tighter muscles and happily, my knee that gave me problems in the ‘80s has been fine for the most part. I want to start speed work in the next few months to see if I can get faster at shorter races (my body has always seemed devoid of fast twitch fibers). I lift weights more than I ever did to build upper body strength not just to help in running but for overall health. Do you enjoy your marathon experiences now as much as you did 25 years ago? I miss that feeling of speed I had when I was younger, when I’d be at the 10-mile mark of a marathon and felt that I could open up the throttle and go even faster. What I do love these days, perhaps even more so than 30-plus years ago, is being in the game. I want to be the one with the number on his chest, the one in the start corral, the one out there competing. And the fact that I’m over 60, and can still go out and do a marathon, is even more satisfying. When I did the Chicago Marathon in 2017 I noted that only three percent of the finishers were 60 or older. That tells me that I’m a part of a unique group of runners. How do you deal with being twice as old and twice as slow then your previous running life? Other than reminding my brain at times that I am not 27 years old, being slower has actually been helpful as I cut back on the intensity and quantity of my running. When I was younger I ran every day, at least three miles, often running hard, and never took a day off. Now I run only four days a week at a slower pace and it is much less physically taxing on me. When it comes to races I have to warm up by slowly jogging a mile to get my body jump-started, then do some sprints to rev up the heart. And now I gauge how well I do by how I place in my age group and not the entire field. Are you glad you came back? What does running add to your life? I am so, so happy I came back to running. It has changed my life. My health is much improved. I am 25 pounds lighter than a few years ago. And I feel younger. Instead of coming home after work and puttering my way through a few chores and watching some TV, I now have focus and goals. And I travel more. I see the country in a way I never would have before because I’m on foot running. I’ve gone places I might not otherwise have were it not for running, and I hope to go to many more. Friends and family have said I re-started my running career. But I prefer a Hollywood term: reboot. I started over, from a similar yet different perspective. Twice as old and twice as slow, I often joke - The Wheezing Geezer. When I’m in my running gear before a workout, a thought pops into my mind: “Hey, I am a runner again!” Something that I thought I’d lost years ago has unbelievably come back to me. I plan on doing for many more years.